OSMtable: A Roundtable About Webcomics – OSMcast! 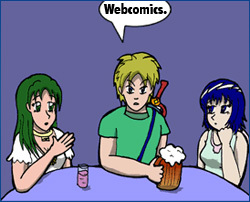 This entry was posted in OSMtable, podcast, Webcomics and tagged podcast, roundtable, Webcomics by Basil. Bookmark the permalink. I’ve only just heard this one episode so far, so I’m not sure how much my opinion is worth, but this episode worked well; it was a lot like a convention panel (namely, very fun and conversational). Next → Next post: OSMcast: The Top 10 Anime of the 2000s OSMawards!